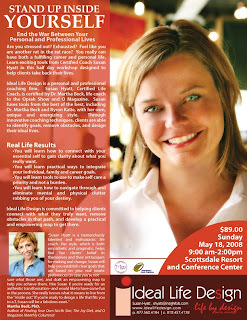 My client, Susan Hyatt, is one of six life coaches leading seminars in an upcoming weekend event hosted by Martha Beck in Scottsdale, Arizona May 17 & 18, 2008. "Steering By Starlight is a weekend long event created by Martha Beck to promote her new book (of the same title). It is open to the public. I am holding my own seminar, Stand Up Inside Yourself, on Sunday, May 18th at the Scottsdale Resort and Conference Center. More details can be found at www.marthabeck.com. 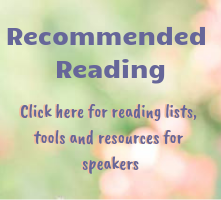 Click on 'Starlight Seminar - Leading Your Life.'" Click on the image above to go to Susan's flyer; you should then be able to click on the flyer to enlarge it. "I'm a gold digger. I wade patiently in the shallow water of convenient cover ups, ready, and pan for the useful nuggets that always lead to something more. 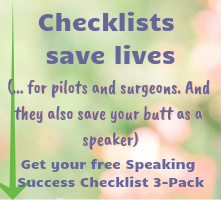 The work that I do with my clients is not about giving them action lists created from a place of 'Here's what you need to do to have a nice life.' It's about digging deep to uncover the gold within themselves. Their plans are always custom made. All of the excuses listed above might seem real, but it's really just a cover for one thing: fear. I love it when clients face their fears and custom build a nice life across the tracks from Stuckville. You won't find directions at Realtor.com. It's an inside job."